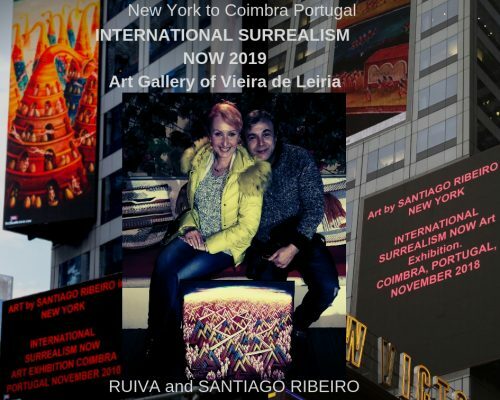 Art by Santiago Ribeiro for the first time in British Lands and the International Exhibition Surrealism Now in Portugal. The art of the Portuguese artist Santiago Ribeiro will be for the first time in British lands more precisely in the city of London. Santiago is the promoter and creator of the world largest 21st century surrealist art exhibition, the International Surrealism Now. PAF developed from an international exhibition called “Parallax” in 2009. Although independent, it still forms an investigative research process, which makes it unique in terms of open exhibitions and fairs designed for exhibitors and designers. Practically, PAF is a new kind of event and different from a dealer fair that many exhibitors may have experienced. One of its aims is to encourage exhibitors and designers to think about their business role. The painting "Butterflies" arrived a few time ago from China Taiwan where was selected to be on Get Art Museum at Art Revolution Taipei will go now to be exhibit in London. TronWoW reached a cooperation with Russia Sky(HBO), community of Game of Thrones.